Main specification which user prefer in a laptop is its battery timing. Day by day every laptop user have problem about battery life. Your laptop's best performance depend upon you. So if you want that you laptop battery life remain perfect or want to extend its life then you should follow some steps. Yes! 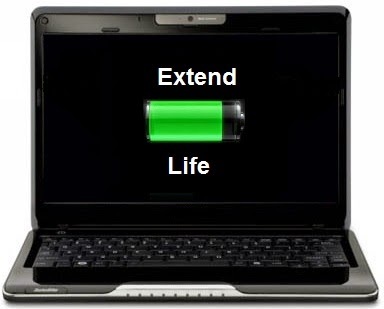 I am sharing with you all these 10 steps to extend battery life of your laptop. Main problem is that user is not much familiar about how to use a laptop. There are built in command in your laptop which you do not know helps to increase battery life. Laptop having window 7 have built in command “powercfg” which shows important information about your laptop’s energy usage and consumption. So, follow given below steps if you want to know How to Extend Battery Life of your Laptop. 1. Switch off WI-Fi connection of your laptop when you are not using internet. It will save power consumption of your laptop. 2.Mute your laptop if you are not listening any audio, music, or video. Or make volume level minimum. 3.Keep your laptop on Power Saver mode and minimize the brightness of laptop. 4. Only turn on Bluetooth that time when you want to transfer file. Otherwise, turn off it. 5.As your laptops OS is multitasking but prefer to do single task in single time. Stop any other program which you are not using. 6. Batteries die if are not use properly. Too high or too low temperature is not best, so use the battery at room temperatures. 7. Unplug mousse, USB device etc when not using. Do not use CD or DVD; if you want any data from it just copy it to your laptop. 8. If you do not want to use laptop for short time then Hibernate it. Stand by mode is risky as at stand by mode your laptop's battery life effects. 9. To improve the energy efficiency, clean the battery contact properly using a damp cloth. 10.To provide proper temperature, use cooling fans. Do not put laptop on the pillow, blanket it will heat up and may cause fire.